The 1930s in New York left behind a profuse artistic legacy during the depths of the Great Depression. Artists, many of whom were supported by the Federal Art Project of the New Deal, found no lack of material to document throughout the metropolis. Here are some of the most representative images of the city during that era. In 1935, Berenice Abbott proposed to document a rapidly transforming New York to the Federal Art Project. Abbott had assisted Man Ray as a sculpture student in New York before moving to Paris, where she served as his darkroom assistant in the mid-1920s. It wasn’t until 1928 that she began promoting Eugène Atget’s photographs of the disappearing urban Parisian landscape, and it was in this spirit that she traversed New York between 1929 and 1938 capturing the old buildings before they too vanished to make room for modern constructions. 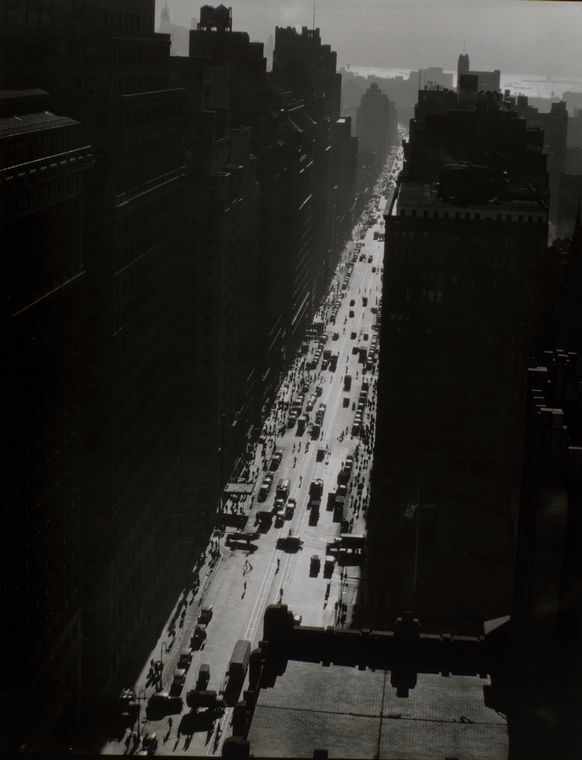 This particular photograph – one of the 302 final images in Changing New York — exemplifies how the urban skyscraper eclipses the street, creating a splendid canyon of man-made constructions. Helen Levitt’s street photography shrewdly frames the energy, mischief, and playfulness of New Yorkers in their resident neighborhoods. She ventured into the poorer areas in the Lower East Side and Spanish Harlem, where she could capture her subjects — from street urchins to grandparents — in their native habitats, resting quietly or setting up the next prank. To photograph them candidly, she attached to her Leica a winkelsucher, a small device that allowed her to look in one direction and take the photograph in another. Designed in 1930 by William Van Alen, the Chrysler Building fuses together the geometric principles of Art Deco in its metalwork and engineering. Margaret Bourke-White, the first female photographer to be accredited by and to work for the United States Armed Forces, became one of the inaugural staff photographers for Life magazine, which began publication in 1936. 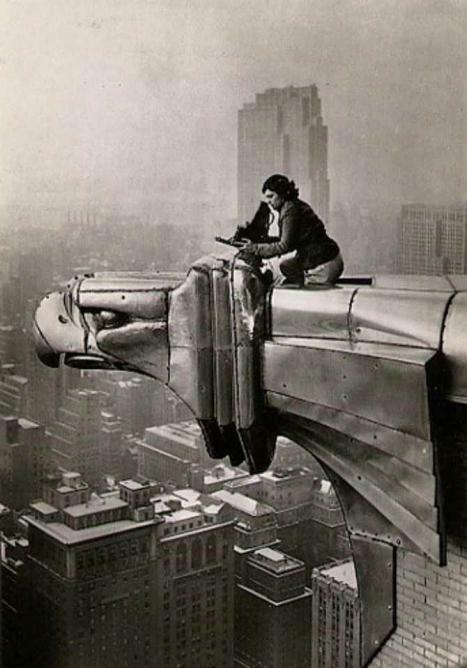 It was for this seminal publication that Bourke-White herself was photographed working atop a gargoyle protruding from the heights of the building. She appears unperturbed by the height — certainly not to be dismissed, as the Chrysler stood as the tallest building in the world at the time. In 1938, Walker Evans set out in subterranean New York to begin his subway portrait series. He boarded the train cars with a 35-millimeter Contax camera secretly tucked away in his coat, with its lens peering out between the lapels. In this manner he was able to catch New Yorkers, from nuns to couples to friends, daydreaming or absorbed in a newspaper. ‘The guard is down and the mask is off,’ he commented. ‘Even more than in lone bedrooms (where there are mirrors), people’s faces are in naked repose down in the subway.’ These photographs include people from a wide array of cultures, occupations, temperaments, and dispositions, a rare confluence of New Yorkers in a common arena. 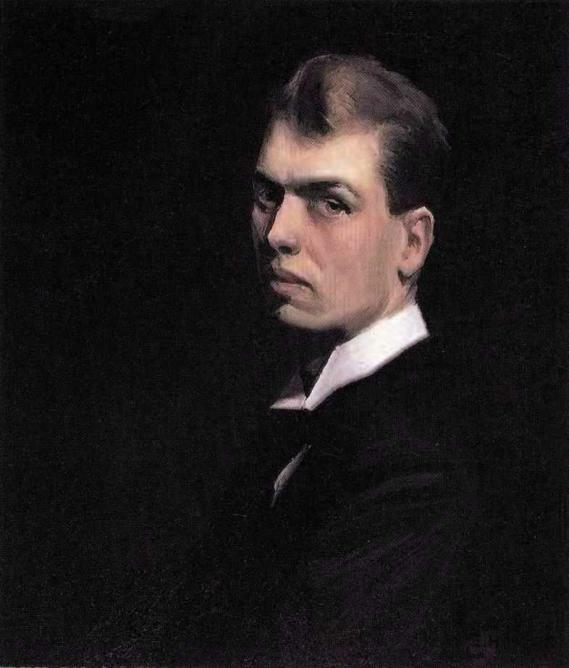 In describing the impetus for the painting, Edward Hopper said, ‘It was suggested by glimpses of lighted interiors seen as I walked along the city streets at night, probably near the district where I live.’ The domestic interior scene is ‘a synthesis of many impressions’ rather than a certain street or home in New York. The undefined facial features of the subjects further elude specificity, suggesting a common lonely experience in urban life. The painting lacks a narrative and highlights this isolation, like in many of Hopper’s paintings, and was painted around the time his wife, Helen, started writing privately about her frustrations with her husband ascending to artistic fame. 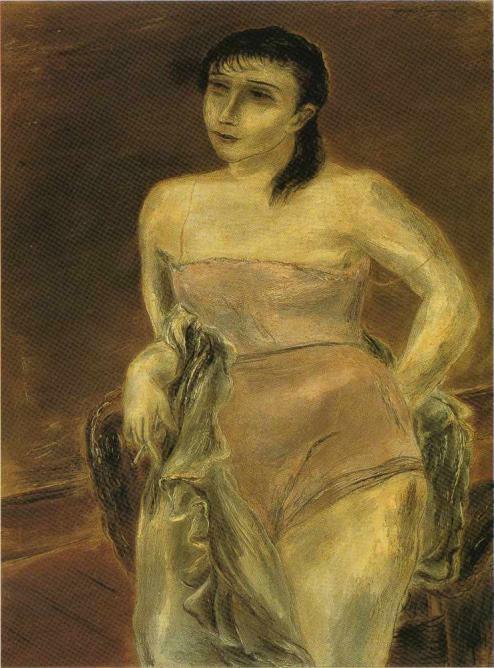 The paintings of Japanese-born Yasuo Kuniyoshi tell a story of a complex American experience. Though well-respected in his lifetime, he was denied American citizenship and faced harsh prejudices during the Second World War. Kuniyoshi came to the United States alone as a teenager in 1906 and shortly thereafter went to New York to study art. His paintings take on Surrealist undertones with his use of unsettling colors and macabre distortion of human figures in a manner that alludes to an earlier folk tradition. In 1948, Kuniyoshi became the first living artist to receive a retrospective at the Whitney Museum of American Art. 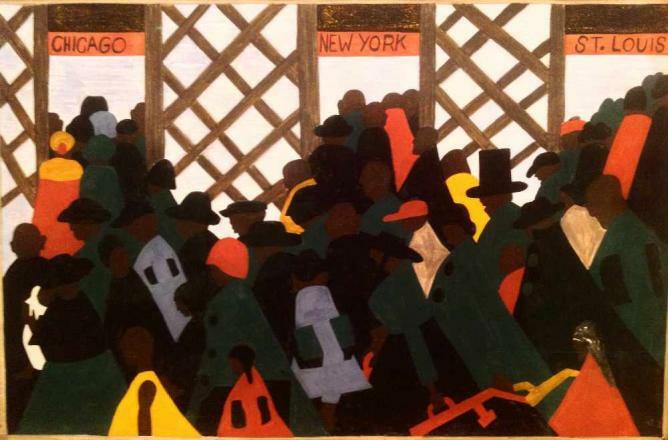 In 1939, Jacob Lawrence began researching for his renowned Migration Series, a progression of 60 tempera paintings illustrating the Great Migration, a mass exodus of African Americans from the South to major cities in the North. Book-ended by train station scenes, the series travels from a bleak depiction of the rural South as a hotbed for social injustice, poverty, and violence to the opportunity — as well as the resulting competition for resources — of the North. From pictures of a classroom to crowds of migrants with their suitcases, Lawrence’s masterpiece vividly speaks to the sharp realities of settling into a new life. Social Realist artist Ben Shahn — an employee of the Works Progress Administration — experimented in documentary photography, although he is perhaps best known as a muralist and painter. Amidst the political and social unrest of the Great Depression and the period between the World Wars, his account of the 1930s New York terrain colorfully peels back the intricate layers of its inhabitants. Here, a rather unlikely trio occupies the same space but maintains a distance, indicated by their body language and gazes. Charles Sheeler’s renderings of a New York view depart from how others portrayed an industrious population, lacking the skyscrapers and frenetic, industrious energy. 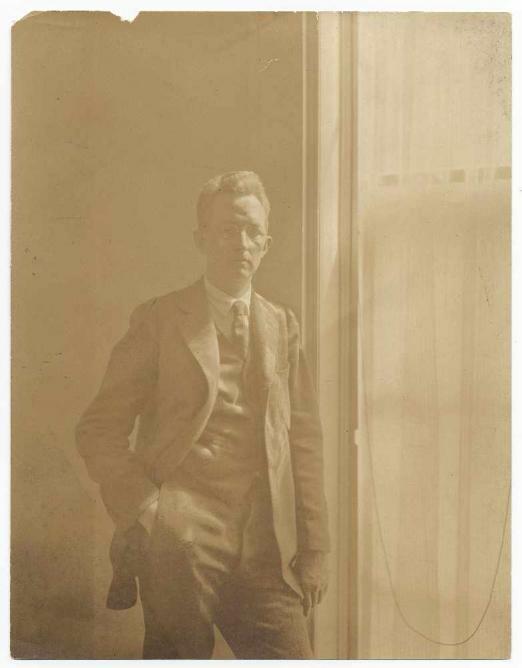 He started photographing commercially as a means to a living in 1912, but strove to gain recognition as a painter. View of New York marks the year in which he gave up photography to turn to painting. Rather than provoking energy and excitement, the view here tends toward the idyllic and serene, recalling perhaps a quiet moment in the past. Dressed in opulent, matching raccoon coats, this pair exits a Cadillac in Harlem during the height of the Harlem Renaissance. The concurrent Great Depression makes little appearance in this photograph, overshadowed by this couple’s apparent wealth. Harlem served as the Mecca of cultural life from the 1920s to 30s for many African Americans, many of whom were leaving the South, and played host to VanDerZee and other creatives such as Langston Hughes and Zora Neale Hurston. VanDerZee created a vast archive of portraits of African Americans from all walks of life, both in the studio and out on the animated Harlem streets, seeking to depict each client in the best possible light. After managing the performance series at the Art Institute of Chicago, Janet moved to Brooklyn to dabble in the art world. She writes about contemporary art and can often be spotted at the closest olive counter.